Our feet work hard for us all year round, and here at Foot Solutions, we want to take the chance to recognise that and make some time to say a little thank you! Our Healthy Foot Challenge is all about taking care of our feet and making sure they’re in tip top condition to carry on doing a great job. Fitness and health are increasingly important as we grow older, and the importance of healthy feet cannot be underestimated. Foot pain or problems can prevent people from exercising and from getting out in the fresh air, which can lead to many physical and mental health issues. Looking after your feet is a great way to look out for your general health and keep yourself feeling great. 1. Notice them! It’s easy to ignore your feet and just assume everything is ok, but foot problems can develop easily if you don’t take good care of them. Conditions such as Athlete’s Foot can be prevented or relieved by washing and drying your feet thoroughly each day and ensuring that you change your socks daily and alternate between different pairs of comfortable, supportive shoes. 2. Pay attention to your footwear. Shoes that do not support your feet properly can cause many foot problems or allow existing conditions to worsen. Get your feet measured by a professional and visit a specialist store such as Foot Solutions to find footwear that is both comfortable and stylish. 3. Exercise. Keeping your whole body healthy requires regular exercise, raising your heart rate for at least thirty minutes, five times a week. Ensure that you warm up before exercising and cool your muscles down properly when you finish to avoid foot problems such as torn ligaments and strained muscles. If you are new to exercising, you should consult your doctor before beginning a new regime. 4. Eat well. A good diet is a vital part of staying healthy and well, and it’s especially important to eat right in order to maintain your foot health since obesity is a leading cause of foot problems. If you are overweight, moving towards a more healthy weight will be of great benefit to your general health as well as your feet. Here at Foot Solutions, we’re kicking off our Healthy Foot Campaign with a competition. 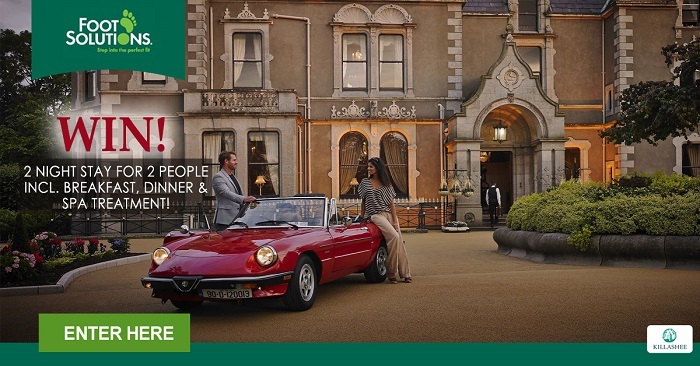 The fabulous prize is a weekend break for two, including two nights bed and breakfast, dinner on an evening of your choice and a spa treatment at the 4 Star Killashee House Hotel & Spa. Join in for a chance to win this wonderful prize! Join us in our Healthy Foot Challenge and change the way you look after your feet forever! Visit Foot Solutions today for a free gait analysis test and find great shoes that’ll keep your feet looking and feeling great all day.